Commercially, some hostas are produced in a high tech process called tissue culture. 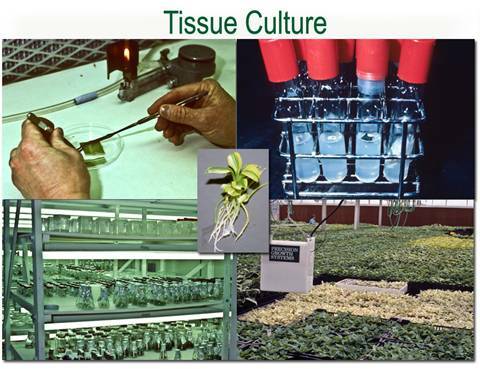 Very small pieces of plant tissue are taken from the mother plant and are processed in a highly sterile environment. The pieces are placed in test tubes with a special substrate and are continually divided as new cells are formed. Eventually, from a small piece of a plant, thousands of exact duplicates i.e. clones may be created. This is an expensive process since every step must be kept in a disease free, sterile conditions. If the growing room is contaminated by fungal spores from outside, everything may be lost to mold and rot very quickly. During this process, sports (spontaneous variations from the original plant) often occur. This can result in a new variety or a plant that must be discarded since it is not the same as the mother plant. 1. Tissue culture must be completed under sterile conditions to prevent contamination by fungal spores. A small piece of tissue from the original plant is cut with a knife that has been flamed on a Bunson burner or otherwise sterilized. 2. The sterile piece of the plant is then placed in a test tube or other glass container with a bit of an organic mixture called auger. If everything goes correctly, tiny plants begin to develop. 3. At the end of a successful process (i.e. no contamination) you have thousands of small plants exactly like the one from which you took the original piece. Since it involves the use of plant hormones and other chemicals in the auger, there is a higher probability of sports being produced in tissue culture. One of the things that has revolutionized the world of hostas in the past few decades is the introduction of tissue culture (TC) for the micropropagation of hostas. There seems to be a bit of mystery associated with TC but, in reality, it is just a high tech method for making new plants from cuttings. We have all taken a cutting from a geranium plant and put it in moist potting soil or perlite to form one new plant. Tissue culture involves taking a very small piece of a plant and turning it into hundreds or even thousands of new copies in a relatively short timeframe. The difference between TC and regular cuttings is that this "space age" technique must be done under totally sterile conditions. It is called an in vitro process which means that it takes place in glass. This makes it very labor and equipment intensive so it is a costly technique. Therefore, TC is generally used to multiply plants that are very difficult to propagate with other more low-tech methods. Or, it may be used to very rapidly reproduce high value plants where large numbers are in demand. The first three stages are completed in glass under highly controlled, sterile conditions. These steps must be highly controlled in terms of the temperature, light, chemical and other conditions to assure success. The fourth step moves out of the laboratory and consists of growing the plants in regular greenhouse conditions the same as any other seedlings or cuttings. As the name implies, this stage is where the whole TC process gets started. In the case of hostas, a small bud is usually removed from the crown of the plant to be propagated i.e. the explant. This bud is delicately "peeled" back to its smallest point and is cleaned and disinfected thoroughly. Throughout the entire TC process, the constant challenge is to eliminate any bacteria or fungi which might contaminate things so all cutting is done with sterilized equipment and usually in front of a laminar flow hood to prevent recontamination by fungal spores in the air. A mixture of plant nutrients, plant hormones and a jelly-like material called agar is prepared under sterile conditions and poured into the bottom of a test tube. The exact composition of the agar mixture may vary from TC lab to TC lab. The piece of the explant is carefully placed in the bottom of the tube nestled on top of the agar mixture. 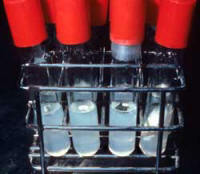 The test tubes are placed on racks in a sterile, growing chamber with artificial light and strict temperature and humidity control. People entering this room will be required to sterilize the soles of their shoes, use medical gloves and, perhaps, wear a sterile gown to prevent any contamination. There is nothing more frustrating than peering into a glass tube and finding grey mold or bacterial slime instead of nice green plant tissue. At this point, the plantlets have no roots so they depend on the sugars in the agar for energy rather than photosynthesis. As the plant tissue in the test tubes grows and buds multiply, it needs more room. So, periodically, it is taken out of the test tube, cut into smaller pieces and distributed into more tubes. This may be done every 4 to 6 weeks and, again, requires strictly sterile conditions. Each time the plantlets are divided and re-tubed, represents the equivalent of about one year's growth in the garden. That means that, if one bud on a division in the garden would put on 4 buds during an entire summer, it would do the same in the tube in about 4 weeks time. A good estimate is that each bud will produce as many new buds in one year as it would in 10 years in the garden. So, you can see how these plants multiply so rapidly under TC. Generally speaking, two plant hormones are used during TC. One is called a cytokinin which encourages bud formation and the other is an auxin that encourages root growth. During the multiplication stage, the level of cytokinin in the agar is relatively higher than the auxin because the TC lab is encouraging buds to multiply and is not yet interested in forming roots. After several rounds of multiplication have been completed, the plants will be switched over to an agar mixture that has a higher level of auxin relative to the cytokinin. That will trigger the formation of roots on the small plantlets. Once the plantlets have formed adequate root masses, they will be divided once more and each one will be planting in a container of potting media. Then, they will be placed in a standard greenhouse for growing on to a saleable size at the retail or wholesale nursery. This is called the ex-vitro (not in glass) phase of the process. _ 1. Clone Production - Since the resulting plants are actually exact replicates of the original plant, TC is a way to maintain the precise characteristics of the original explant. This is vital in reproducing named cultivars of hostas where it is important that each one be exactly the same as the original plant. _ 2. Difficult to Propagate Plants - TC may be a last resort option for some plants that do not easily propagate through standard cuttings, seeds, layering, grafting or other methods. Of course, the resulting plants will need to be of high value to justify the cost. _ 3. Fast Production - Plants reproduced through TC can be rapidly multiplied and quickly made available for sale. This is especially useful for plants with high demand which can still maintain a decent price level. From a small piece of a plant, a good lab can turn out hundreds to thousands of clones in a few short months. In the earlier days of hostas, new cultivar introductions almost always carried a large price tag. This was because that first plant was the only one of its kind in the world. If it were a slow growing type, it might take 4 or 5 years to make 10 to 15 divisions. For a wonderful new plant, people would often be willing to pay hundreds of dollars to have one of those rare divisions. In this scenario, it would take many, many years before the cultivar would be generally available at a more affordable price for the gardening public. With TC, that same plant would produce many new plants for sale within a year or two. This larger supply would result in a more reasonable price tag too. _ 4. Disease Free Plants - Because it is done under highly controlled, sterile conditions, TC may often be used to produce certified, disease free plants. By using specific techniques, virus infected plants may often be propagated with the resulting clones being virus free. _ 5. Sports - Hostas tend to be a plant that frequently mutate or "sport" on their own compared to other plant genera. Because a variety of growth hormones are routinely used in TC and since huge numbers of plants are produced in a short period of time, this tendency is enhanced. In a population of say, ten thousand plants of a particular hosta cultivar, there may occur dozens of sports. Imagine how many gardens you would have to visit to observe this phenomenon in the home landscape environment. With TC, however, you might have ten thousand plants of the same cultivar produced by the same lab. During the quality control inspections of the plants, you are bound to find...guess what...dozens of sports. Of course, only a small number of these variations will be worthy of naming but TC has become a major source of new hosta cultivars in recent years. So, why not use TC to propagate all hostas? _ 1. Expense - TC requires a high level of investment in equipment and highly trained staff. Therefore, it is not economically viable for every nursery. It is usually more cost effective for small nurseries or growers to propagate a plant by some of the older, low-tech methods which do a good job at a much lower cost. However, in recent years, more independent TC labs have come into existence who only propagate the plants and sell small "plug" size plants to wholesale and retail nurseries. As a result, even many of the smaller retail outlets are able to afford to use TC plants. _ 2. Sports - While this can be an advantage with certain species such as hostas, it can also be a negative when too many, useless sports result and must be trashed. This factor is another cost consideration since plants must be inspected closely at all steps to assure quality. _ 3. Sanitation - The specter of fungal infections ruining an entire environmentally controlled room full of test tubes hangs heavily over the head of every TC lab. Extensive efforts must be made to take care in every step of the process to prevent contamination. The big question that has circulated around the hosta world since the beginning of TC is, "Are tissue cultured plants as good as those divided from a plant growing in the ground?" The answer is a resounding, YES! Just like taking a knife and cutting a part of a hosta crown off to make a division, TC plants are exactly the same as the mother plant. I think some of the confusion comes from a couple of factors. First, in their effort to make a quicker return on their investment, some nurseries sell tiny, little TC plants in two inch pots. Of course, it may take a year or two for these to grow to the size of a single division taken directly from a mother plant. If for example, both plants came from an H. 'Sum and Substance' mother plant, they should both eventually grow to the same mature size given similar growing conditions. It may take the TC plant a little longer because it started as a smaller plant. If the TC plant is grown to a good size at the nursery before you purchase it, there should be no difference between it and a similar size hand-made division. Another point of confusion may come from the fact that there are a lot of sports produced during TC. People seem to think that the fact that the TC lab has used plant hormones to manipulate that process that there must be something "unnatural" about all of the plants produced in this manner. As mentioned previously, hostas naturally produce a lot of sports. TC produces many, many plants in a short period of time and, with the extra hormones, it accelerates this natural process. The "non-sports" should be perfectly fine and just exactly like the mother plant cultivar.